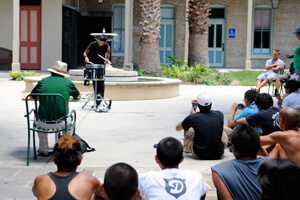 A snare drummer competes at the 2011 I&E Competition. In San Antonio, the competition doesn't end on the field Saturday night. 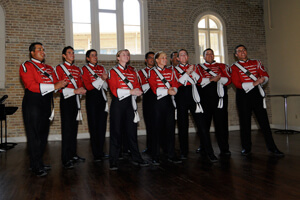 On Sunday, July 22, small ensembles and soloists from World Class corps will participate in the 2012 Drum Corps International Individual & Ensemble Competition. I&E gives corps members the opportunity to show off their individual and group talents, performing solo and ensemble pieces perfected by corps members outside of their normal corps rehearsal schedules. Even further, vocal and woodwind categories give members whose primary instruments may not be included in a normal drum corps setting the chance to perform. In 2012, the World Class I&E returns to historic Sunset Station (1174 E. Commerce, San Antonio, TX 78205), a facility located just a few blocks from San Antonio's Alamodome, Convention Center, and River Walk. Public parking is available around the venue. Most lots will cost around $5. The event is free and open to the public. Performers will be spread out in several different locations within Sunset Station: Depot 1: Color Guard Depot 2: Percussion Depot 2: Low Brass Pavilion: Snares, Ensembles Crown 1: High Brass, Woodwinds The Spire: Brass Ensembles, Vocalists Learn more about Sunset Station. A Boston Crusaders vocal ensemble performs. Approximately 370 performers will take part in the Individual & Ensemble Competition in 2012. Kicking off at 10 a.m. CT, the event will run until approximately 1:30 p.m. Performers and performance times are subject to change. The panel of I&E judges includes: Color Guard: Mickey Kelly, Michael Lentz Percussion: Martin Griffin Low Brass: Steven Page Snares/Ensembles: Glenn Fugett, Richard Saucedo High Brass/Woodwinds: Paul McGarr Brass Ensembles/Vocals: David McGrath (brass), Andy Cook (vocals) Where are the Open Class corps? The Open Class Individual & Ensemble Competition will take place as part of World Championship festivities on Wednesday, Aug. 8 at the Indiana Convention Center in downtown Indianapolis.